The UK’s large-scale battery storage installations have reached 100MW of capacity, made up of around 50 individual sites larger than 250kW. The data from our UK Battery Storage Project Database report shows that these projects can be split into three categories: pre-2017, stand-alone in 2017 or co-located with generation in 2017. We have chosen these categories as 2017 was the first year where commercial projects began to take off. Before 2017 the majority of completed batteries were demonstration or research projects, such as the Leighton Buzzard battery by UKPN or the Northern Powergrid battery storage trial in North East England, and account for around a quarter of installed capacity. Of the 100MW nearly 60% of capacity added in 2017 has come from batteries co-located with generation, both renewable and non-renewable. Solar Media Market Research has good visibility of the batteries co-located with solar farms and these have been both new build and retrofit projects. Solar farms either added the battery at the build stage, before the RO deadline in March when new solar capacity was added or more recently as part of subsidy-free solar projects. In 2017 we saw the beginning of commercial stand-alone batteries with Hazel Capital completing two projects; Lockleaze a stand-alone battery and Staunch a hybrid battery/engine and E.On with the completion of Blackburn Meadows. Both of these companies have projects with capacity market contracts either from 2015 or 2016, with the E.On project also receiving an EFR contract, which will be in place up until the capacity market contract begins. Meanwhile, Staunch by Hazel Capital also has a two year firm frequency response (FFR) contract from 1 October 2017 to 30 September 2019. But what can we expect in the coming months? In the near term we have visibility of projects that have won contracts and when they are due to start. For example the 200MW of successful EFR projects from 2016 will need to come online by the end of February. Out of the eight projects, we know of one that has already come online, with the others following closely. Out of these projects five also won contracts in the 2016 T-4 capacity market, which will follow the four year EFR contract. With this in mind we can expect to see the remainder of the EFR projects built in either Q4 2017 or in the first 2 months of 2018 which would be an addition of around 190MW, effectively tripling the UK’s installed battery capacity within the space of a few months. With five of these also winning capacity market contracts, and by looking at those that have been completed, we start to see the capacity market becoming a recurring and important trend within a stacked revenue model. Going forward we know that there will not be any more rounds of procurement for EFR in its current form but we have seen interest from battery storage developers and owners in FFR increasing over the past few months. Battery storage projects have begun to submit applications and after some trial and error there are now at least four large battery projects with FFR contracts. The developers or aggregators submitting these projects have used different variations of availability and price and after a lot of rejections we are now seeing some of these companies having success in this area. Once again we are seeing projects with capacity market contracts due to start as the FFR contracts come to an end. The pre-qualification window for the 2018 capacity market recently closed and there are projects which have already made known their intention to participate. The upward trend in planning applications over the summer also suggests that this year’s capacity market will be hotly contested. National Grid previously announced its intention to change how it procures balancing services such as FFR and EFR so going forward project owners know that this area will be changing. It therefore appears that the relative stability and longer term contracts of the capacity market are highly important in making the business cases stack up for new battery storage projects. Capacity market pre-qualification results will be announced on the 10 November and a lot of questions will be answered about who is active and how much capacity will be competing for contracts. The main conclusion we can come to at this point is that over the lifetime of a project new revenue streams and functions of the batteries will emerge and the technology will evolve to serve these needs. But it is important for these companies to secure some level of revenue to get their projects off the ground in order to take advantage of these opportunities as they emerge. 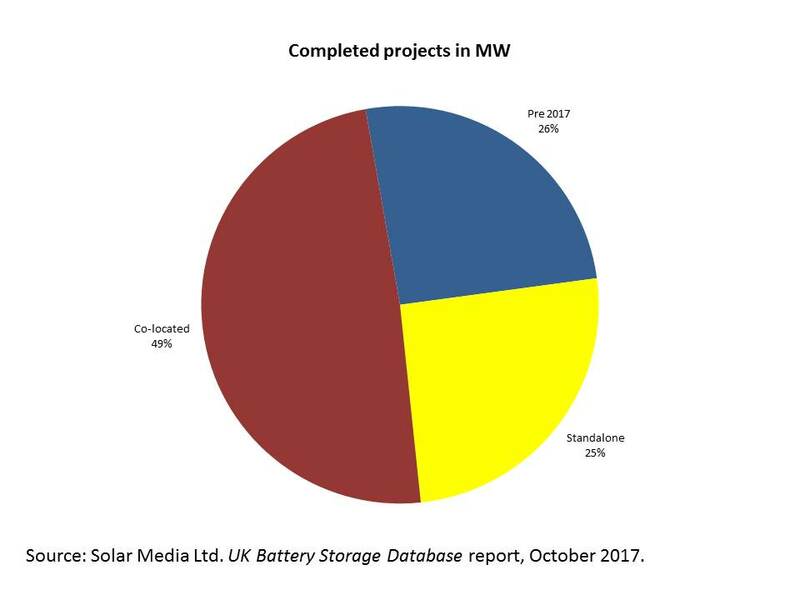 For more information about proposed and operational storage projects, the UK Battery Storage Project Database report from Solar Media market research provides comprehensive details across more than 200 battery storage projects. For more information, click here, or email: marketresearch@solarmedia.co.uk.